Kenneth Branagh’s Macbeth: an interpretation for our times? Sir Kenneth Branagh’s “electrifying” and “immersive” production of Macbeth is the current hot Shakespeare ticket, playing for just a month in a disused church in Manchester that seats only 250 people. It’s ensured that Manchester’s International Festival has received worldwide attention. A quick internet search reveals reviews from right across the USA and responses from ticket-holders making a special trip from as far away as Germany. Although the tickets cost £65 each, with a few concessions for Manchester residents, it’s reported that they sold out in half an hour. All is not lost for those without tickets though: in Manchester on 20 July this intimate production is being relayed live to a giant outdoor screen, and simultaneously will be shown in around 650 cinemas around the world. Michael Billington of the Guardian has recommended people not to miss this live event and most of the reviews have shared his enthusiasm. Here are links to the review in the Daily Telegraph, The Stage, and the Financial Times, and a roundup from the USA. 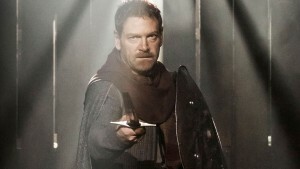 The production marks the return of Kenneth Branagh to the stage in a Shakespeare role for the first time in ten years. Now 52, I suspect he was waiting for the right moment to play this superb role. Macbeth is often played much younger, helping to explain his impetuosity in grasping the throne. In 2013 we’ve already seen two young Macbeths, by James McAvoy and, currently at the Globe, Joseph Millson. Both these have stressed the humour of the play, and at the Globe, the initial innocence of the protagonist. Other productions have made much of the importance of religion, or the horrors of the supernatural. So it’s already been a great year for Macbeth, but Branagh’s production, rather as I heard Stephen Boxer say about Titus Andronicus, shows the effects of long-term violence on the human psyche. In his interview with Radio 4 Today’s Evan Davis Branagh talks about the idea of “dis-ease”, and how the play’s relevance lies in its preoccupation with the inner life, of what he calls “self-talk”. At least one of the morals of the play is that “you should be careful what you wish for because with it, comfort does not come”. The play has long had a reputation for bad luck, perhaps not surprisingly given the potential for accidents. 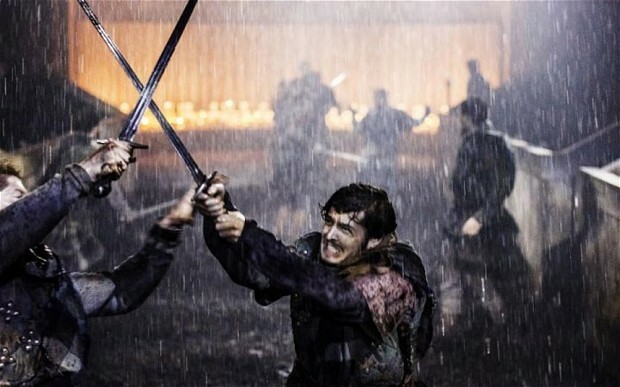 In this production the stakes are raised: the opening battle, only described by Shakespeare, is staged with thunder, lightning and rain as well as real swords wielded only a few feet from the audience. The Daily Telegraph reported that Branagh had injured one of the actors during this high-energy battle scene. Ever since he first came to wide public view, with his 1984 RSC Henry V aged only 23, he’s been called the heir to Laurence Olivier, who notably brought many of Shakespeare’s plays to both stage and screen. A rumour is now circulating that he may be appointed to lead the Old Vic in London. This theatre housed the National Theatre for some years before the current building was constructed on the South Bank. The Artistic Director at the time was none other than Laurence Olivier. Branagh’s career has twisted and turned since his early meteoric success, but in this Dominic Cavendish reminds us of the Branagh-mania which accompanied his precocious work in the 1980s. If you want to catch this latest production, follow the link to book to see it at your local cinema live on 20 July, or if you’re lucky, at an Encore presentation later. This entry was posted in Plays and Poems, Shakespeare on Stage and tagged Kenneth Branagh, Macbeth, Manchester, Old Vic. Bookmark the permalink.